A classic value investment style looks for stocks which are undervalued by the markets and go long if the fair value of a stock based on the futures earnings power is greater than their current market price. The key to success is to find stocks that contribute the most value within the timing of the investment. The strategy is simple, invest long-term and take advantage of short-term declines. Can this same investment style be applied to trading systems? The size of possible losses is reduced. In case the system has stopped working, an investor does not suffer the entire drawdown from the peak till it is detected that the system does no longer work (one can use the past historic drawdown amount as a way to measure when/if a system stops working). The probabilities for higher than average short-term returns are elevated as robust systems tend to revert back to their average returns after a drawdown. As we can observe from the above graph, based on the past performance, the best time to start trading the system is when it is in a significant drawdown, with the program having come back from three separate major drawdowns (over $15k) since it has been traded by live clients. This does not always mean that immediate gains are right around the corner, however. For instance, the climb back from the 2013 drawdown took 2- 3 times longer than the past ones, and the drawdown went about 1.5 times further than the past ones due to market conditions in 2013 not being very favorable for the system. So is a “value” approach right for you? You’ll have to decide that for yourself, and the above is only one approach to determine when to start trading a system. But as I look at it, value entry points like the system is offering currently present a lower risk opportunity to get in line with a system’s equity curve. The returns for trading systems listed above are hypothetical in that they represent returns in a model account. 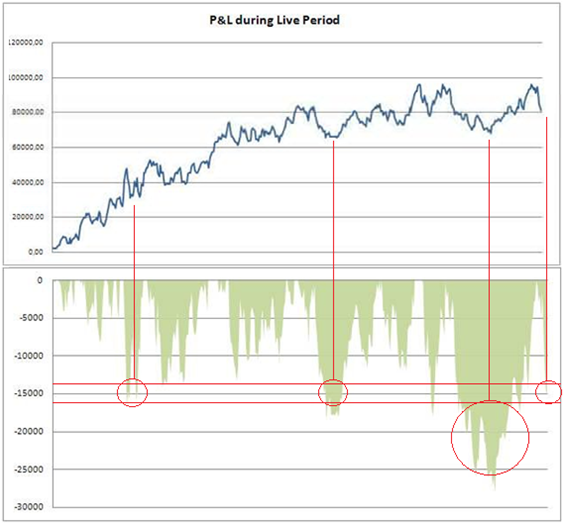 The model account rises or falls by the average single contract profit and loss achieved by clients trading actual money pursuant to the listed system’s trading signals on the appropriate dates (client fills), or if no actual client profit or loss available – by the hypothetical single contract profit and loss of trades generated by the system’s trading signals on that day in real time (real-time) less slippage, or if no real time profit or loss available – by the hypothetical single contract profit and loss of trades generated by running the system logic backwards on backadjusted data (backadjusted).